The September Issue of Elevation Outdoors is LIVE! Aging does not mean slowing down. These older athletes talk about competition, overcoming injury and the secrets to staying fit longer. As visitation at Boulder, Colorado’s favorite park skyrockets, the city experiments with how to deal with an ever growing crush of recreation seekers. A group of mountain bikers honor their friend, the world-famous photographer Doug Pensinger, by tossing his ashes into the Canyonlands winds. Emmy-winning filmmaker, Michael Brown, loves to teach. With cooler weather on the horizon, it’s time to revisit this mountain biking standby—and discover new spots to nosh and spin in Moab, Utah. Politicians more interested in short-term gain than preservation want to take these three magical, wild spots away. You can save them. Download the free ViewRanger app and the following coordinates to take on this trek through the wilds of Colorado’s Sangre de Cristos. Do the math. This outdoor industry supported organization funnels much-needed cash to grassroots conservation groups. 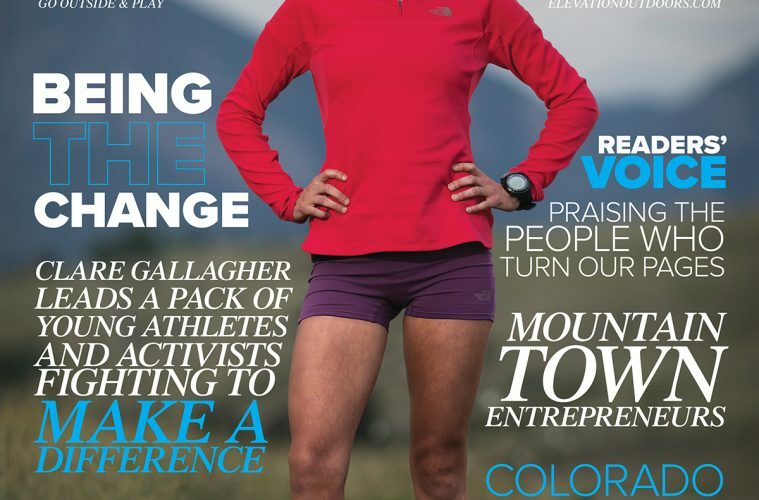 To celebrate our readers in this issue, we sought out someone who loves Elevation Outdoors and lives and breathes the healthy, active lifestyle we embody. Meet Jeremiah Osborne-Gowey. A dedicated group of Colorado DJs and promoters are hosting dance parties with an inclusive vibe that put the focus on getting down rather than raking in cash. Move to Colorado to embrace the mountains and you have to live up to the badass idyll and become a rad, overachieving climber, skier, hiker… or do you? An injury and real time in the hills taught this transplant the true meaning of the life in the high country. Why do mountain towns inspire so many entrepreneurs?